The drive to outsource and leverage third parties (vendors) has been increasing globally as organizations turn to outsourced service providers to reduce operating costs, gain a competitive edge, leverage superior expertise and increase their focus on core competencies. However, reliance on third party relationships can increase an organization’s business exposures, often due to poor oversight and control on the part of the organization or inferior performance of the third party. 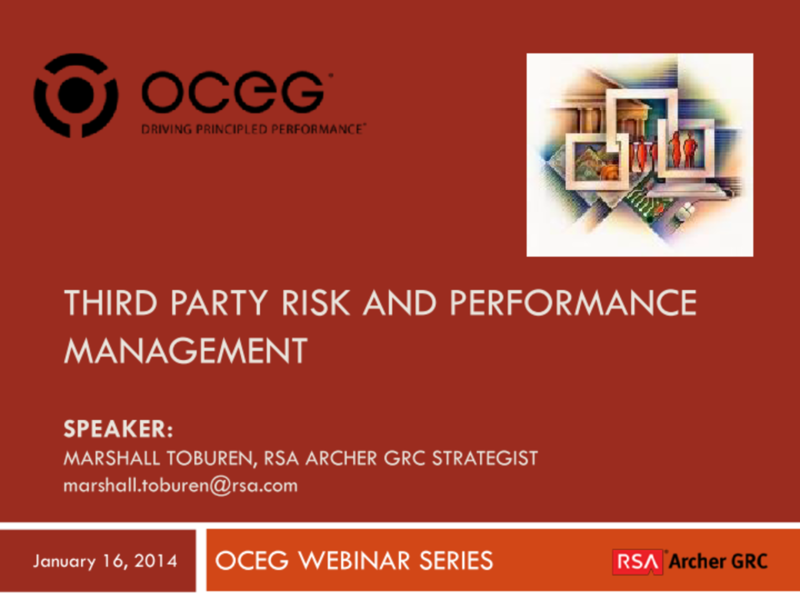 We have emailed instructions to access Third Party Risk and Performance Management – SLIDES to . Make sure the email arrives in your inbox: either add "support@oceg.org" as a safe sender to your email platform, or if you use Gmail, drag our email into your Primary tab.